our thoughts + hearts are with you. Please consider helping in these three simple ways. My heart goes out to those in the midst of chaos and devastation. 1. "The Help Japan poster is now available to preorder in the Signalnoise Store, and will be gin shipping on March 18. All profits made by the sale of this poster will be donated to help relief efforts in Japan. Head to the Signalnoise Store now to see full details." go here to support! 2. 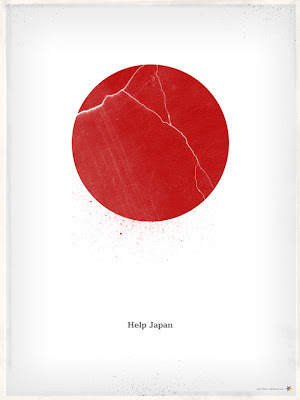 "Those who want to help can go to www.redcross.org and donate to Japan Earthquake and Pacific Tsunami. People can also text REDCROSS to 90999 to make a $10 donation to help those affected by the earthquake in Japan and tsunami throughout the Pacific." 3; $10 Raffle Entry Enter to win, affect change... This is a raffle ticket to raise money for our friend Akio and his community to rebuild after the earthquake in Japan. Heath will match the total money raised by the raffle. Akio is an inspirational Japanese potter and a friend of Heath's. He was on his way to the opening of his show at Heath LA when the devastating earthquake hit (he and his family may still be here, they really want to try and make it! ).